A very attractive species, Erythronium multicapoideum is from North America and has wonderful flowers as well as attractive mottled foliage. Spring flowering and thriving in a position where it receives winter sun and summer shade this is a classical woodland plant. Excellent beneath a large deciduous tree and equally at home in a container. White flowers with an inner yellow centre this is an early flowering species and adds great interest to the garden in late winter to early spring. Once established multiple flowers will appear from each tuber. 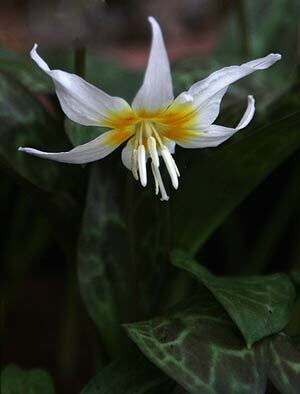 In full flower Erythronium multicapoideum will reach around 25cm in height. The small bulbs can be planted at around 5cm deep, they will naturally pull themselves down to an appropriate depth in a good humus rich soil. The bulbs are rather delicate and resent drying out so make sure when punched by mail order that they arrive well packed and moist. Shade in summer and do not allow the ground to dry completely. Easiest by division of larger clumps in late winter. Propagation from seed sown fresh in summer should lead to germination the following autumn.